For some reason, the Wednesday Herald running column isn’t being added to www.herald.ie. So here is this week’s edition for anyone who didn’t get the Herald today. Well over a hundred women of all ages, sizes and levels of fitness turned out for Sunday’s Meet and Train league race in a sodden Bushy Park in Terenure. Because of the conditions, the two mile race was switched from the grass to the roads, but no-one was complaining. It’s now over thirty years since Meet and Train running started. The free training groups were organised all over the country in the run-up to the very first Women’s Mini Marathon held in 1983. Out of that came a series of graduated road races over two, three, four and five miles so that women could test their fitness in those pre-Parkrun days. Then, as an incentive to keep training in the dark winter months, came the Winter League – a series of four two-mile races on gentle cross-county courses. From the start the races got great support from the traditional clubs that had started their own Meet and Train groups. It gave women, many of whom had never competed in anything ever, a chance to run for a club team, and to meet up with women from other groups over the post-race cuppa. Winner last Sunday was Aisling Carroll of Fingallians, with Dunboyne’s Laura Buckley second. In the top ten alone came runners from Blackrock, Trim, organising club Sportsworld, Crusaders and Lucan. Also in evidence were the club vests of Brothers Pearse and Tallaght, as well as the distinctive black and amber of Clonliffe Harriers. With a group of 29 stalwarts led by Pam Cooper, Clonliffe is sure to do well in the graded team categories. There’s always room for more – next race, organised by Brothers Pearse, is tentatively scheduled for Firhouse on January 24. Watch this space! John Coghlan of MSB and Caroline Crowley of Crusaders were the winners of the Tom Brennan New Year’s Day 5km held in Dublin’s Phoenix Park. Coghlan, a many times previous winner of the race, controlled the race up from from the start, finishing in 15 mins 16 secs, which was enough to hold off Ben Branagh of St Malachy’s, who was just two seconds adrift. Third was Raheny’s Daire Bermingham while fourth and first junior was Cathal Doyle of Clonliffe. Coghlan, who experimented with the steeplechase last year will now concentrate on the indoors, specifically the 3000m. “I hope to run a few races over the season and maybe get to the Millrose Games in NewYork and a few others mets over there.” Apart from that, he’s still planning the rest of his season. Crowley, now advised by Catherina McKiernan, was an even more emphatic winner of the women’s race in 16 mins 43 secs. “My target for the year will be the 10,000m qualifying time for Rio, but in the meantime, I’ll be doing some cross-country races,” she says. By a miracle, the forecast storm held off until most of the 700-plus field was home when it began tipping down rain. The race attracted more women than men, probably because of the large teams from the Lord Mayor’s 5-Alive Challenge and the Waterstown Warriors. 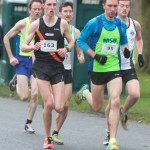 In Westport, Declan Fahy won the Resolution Run 5km in 16.387, beating local lad Joe Hastings currently running with UCD. In the women’s race, Mayo’s Colette Tuohy was first home ahead of Kilkenny junior Aoibhe Richardson, who in turn had over half a minute to spare on her mother Niamh, a former Irish international athlete, who is a Westport native. Lizzie Lee of Leevale joins Kilcoole’s Fionnuala McCormack on Team Europe at Saturday’s Great Edinburgh Cross. McCormack, who led the Irish team to bronze at the European Cross-Country Championships finished her year in the best possible style by winning the Lotto CrossCup in Brussels, Belgium. In last year’s Edinburgh race, she finished second behind Britain’s Emilia Gorecka. Selected for the 4 x 1km mixed relay are John Travers, Eoin Everard, Laura Crowe and Kerry O’Flaherty. Also scheduled for Edinburgh is the Celtic International with U23, junior and U17 teams competing , as well as junior and U17 development teams. Shona Heaslip of Riocht and David Scanlan of Rathfarnham lead the U23 teams. Clonliffe’s Hope Saunders, who missed out on the Europeans, and Kevin Mulcaire of Ennis rn in the junior races. Development teams will also compete. A healthy entry of close to 400 is expected for Sunday’s Dublin Masters Cross-Country hosted by Raheny Shamrock in St Anne’s Park – one of the biggest cross-country races of the year. Last year, Donore’s John Dunne won the title for a third year and led Donore to M35 team victory. In second place was Peter Matthews of DSD who was also first M45. Raheny, with newly minted 50-year-old Mick Traynor in fourth place overall, was first of the M50 teams and they’ll be favourites to dominate again. Winning the women’s race was former Irish international Niamh Fitzgerald of Lucan Harriers, who hasn’t done much since. A year earlier, Raheny’s Elish Kelly won – and then promptly vanished. Donore had a good day, winning the women’s W35 title led by Anne Curley in second place. Civil Service proved best of the W50 teams, beating DSD. All these clubs and many of the same athletes will be back in action on Sunday, when a surprise or two is almost guaranteed. 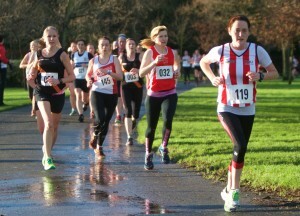 Coming up on Sunday January 31 is the AXA Raheny 5-Mile – the first “marquee” road race of the New Year. Entry is already open and if you register before Sunday next, you will get a personalised number. So what are you waiting for? Enter online for €20 plus processing fee at www.rahenyshamrock.ie. All finishers get the special Raheny plaque and goodie bag.